Another Spanish city break. Another girly getaway. This time Valencia was calling . . .
We’re going back a while now but in celebration of the end of exams and thus, the end of my second year at Cardiff university / reaching the half way point in my degree etc. (who needs excuses anyway yada yada), two of my housemates and I booked an urban girly retreat to Valencia, Spain. Having all acclimatised to the matte skies of Cardiff, the Spanish sun was most definitely calling. Be warned, this is a photo heavy post! I’m a sucker for a city break so when mumma suggested a girly Easter getaway, I was so down. We decided on Barcelona, having both wanted to visit for some time, and what a fabulous decision it was. Arriving on morning of the Tuesday 11th and flying home on the afternoon of Friday 14th April, we had 3 nights and plenty of daytime to wander around and explore the city. Let’s take a look at our mini adventure through photos! Having just arrived home from a wonderful fortnight in Normandy, I thought it about time I return to the blog having not posted since before my first set of university exams. So, before getting into talk about my travels, I should say that all went well. I finished my first year studying French at Cardiff University with 69%, one frustrating percent from a 1st but delighted nevertheless. After months of lazing around at university and taking my first year pretty easy, I was so ready for a break having done some real work again for a few weeks. Normandy was the absolute ticket and oh so relaxing. Having been kindly invited along by Tom’s dad, we had been so looking forward to this trip for weeks! After my new passport finally arrived, we decided that I would drive to Portsmouth, we would catch the ferry to Cherbourg, (I would be brave) and drive to the château on the other side. 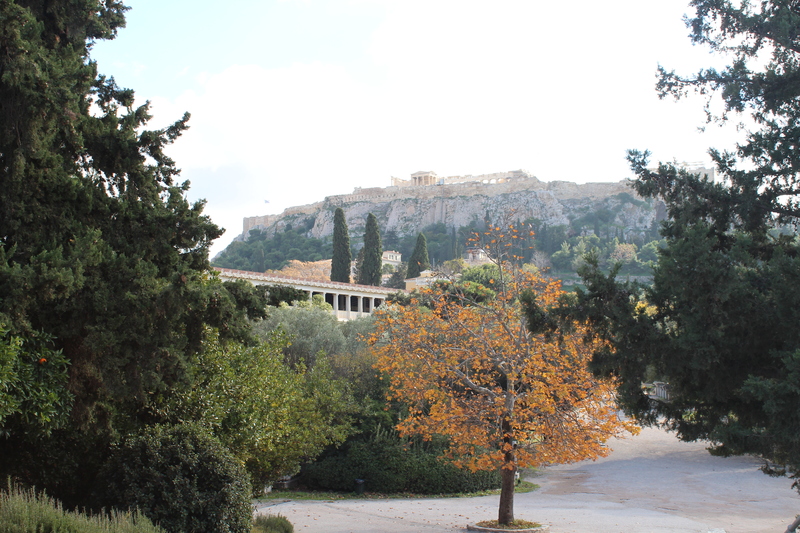 Here it is, the ultimate post in the trilogy recounting my recent trip to Athens. I thought of no better way to build the anticipation than to leave the historical sites of ancient Athens until last. After all they are all quite something, in both feat and appearance. The Parthenon is quite simply the most amazing thing I have ever seen and I can only hope that these photographs of mine do it some justice. The sheer size of it was unbelievable and to see such a thing in real life was completely mind-blowing. I haven’t seen a photo yet that captures its enormity, but these are the best I’ve got. As intended, the Acropolis stands, still today, above Athens and reigns over the city. This results in fabulous views from each and every one of the central ancient sites as well as from the Acropolis Museum. I love how much of a focus the Acropolis is, and just how majestic it looks in the following shot. The moody tone of the composition only enhances all of that and it’s definitely one of my favourite shots of the trip. View of the Acropolis from the Ancient Greek Agora. I really enjoyed wondering around the Agora as it brings everything back down to Earth. Yes, the temples and the artefacts and grandeur of all of that is incredible but for me there was something really human about the Agora. As a central meeting point, market and square full of taverns etc. the Agora was the centre of the city’s life and it therefore offered a sense of the everyday that I found really interesting. This is the Temple of Hephaestus which is incredibly well preserved and well worth a visit. I’ve reached the end of the ‘Athens Trilogy’ now and all there is left to say is what a fantastic time I had on this trip and that I would most definitely return. Athens offers all you could ask for in a city break in my opinion and I have tried my best to capture what I find the most important aspects, in these three posts. The food was delicious and astonishingly cheap, the museums were modern and well designed and the ancient sites really were the most incredible things I have ever laid eyes on. Thank you for sticking around until the end and reading about my holiday – hopefully there are many more adventures to come! For me, no city break is complete without several visits to its greatest museums. They are central to any city and are the epicentre of identity for each and every one of them. The entire point of such trips is to gain from the culture of another country and learn from its history. There are very few other places that can open your eyes to and teach you these things in such a way as Athens. The National Archeological Museum of Athens is a literal trove of the most amazing things you could ever lay eyes on. The mere idea that some of the objects in the vast collection are thousands of years old is mind-blowing and completely mesmerising. Gold, marble and bronze galore. The Acropolis Museum is so beautifully laid out and designed in such a modern and minimalistic way that the exhibits really stand out as they rightly should. They all stand alone and are uninterrupted in expansive, spacious and flowing rooms that are easy to direct. The huge glass panels allow for glorious views of the Parthenon as seen in the photograph below. I absolutely love this shot of the Parthenon from the Acropolis Museum. Visiting the museum first and witnessing this view just makes you 10 times more excited to get up there in the following days. Two other museums that we visited were the Epigraphic Museum (situated next to the National Archeological Museum) and the Museum of the Ancient Agora, both also worth a visit. As students from an EU country, all of our museum tickets were free of charge which was absolutely amazing as it allowed opportunity for multiple visits and meant no rushing.